Bizarre looks notwithstanding, the “Flying Clog” was an important part of the Luftwaffe’s maritime reconnaissance program. It would frequently rendezvous with U-boats at sea, bringing them diesel fuel. In 1933 the Luftfahrtkommissariat (part of the Air Ministry) issued specifications for a longrange reconnaissance flying boat. That year Dr. Richard Vogt of Hamburger Flugzeugbau GmbH, a subsidiary of the famous Blohm und Voss company, conceived an unusually configured design. Initially designated the Ha 138, this was a trimotor craft with dual booms. Moreover, the short fuselage also doubled as a watertight hull. The initial flight trials in 1937 revealed it to possess serious aerodynamic and hydrodynamic deficiencies, and so extensive modifications were undertaken to correct them. This entailed enlarging the fuselage by 50 percent, lengthening the booms, and redesigning the tail section. The craft was approved for production in 1939 under the revised designation Bv 138. The initial preproduction batch of 25 machines saw service in the Norwegian campaign of 1940, where they were judged underpowered and restricted to transport duties. 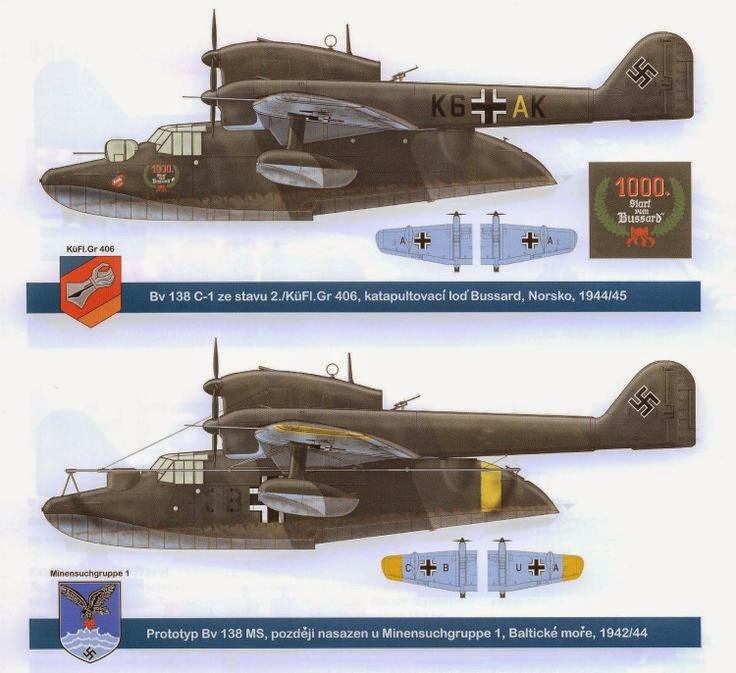 Continual refinements resulted in appearance of the Bv 138B with stronger engines and greater armament. The open gun parts were fitted with power turrets mounting 20mm cannons. 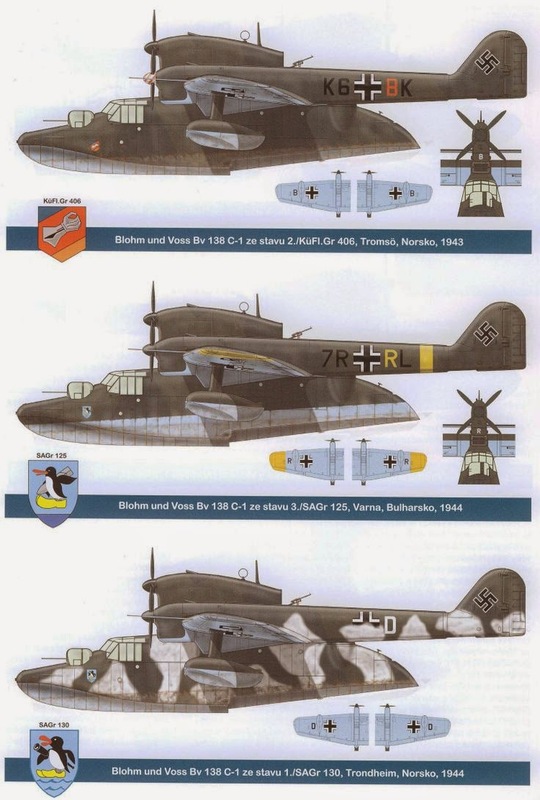 The final production version, the Bv 138C, arrived in the spring of 1941, featuring additional machine guns and more efficient propellers. 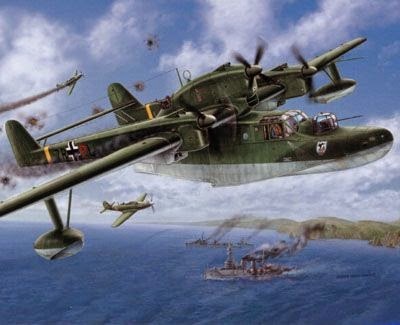 By now the Bv 138 possessed fine flying and water characteristics and functioned well in its appointed role. Crews nicknamed it Der Fliegende Holzschuh or “Flying Clog,” because of its distinct shape. In service these fine machines flew from bases along the North Sea and Norway, constantly shadowing Allied convoys and providing intercept coordinates for U-boats and surface raiders. Given its 18-hour endurance, Bv 138s would also alight next to U-boats far at sea, provisioning them with food and diesel fuel. A final version, the Bv 138MS, was equipped with a large degaussing ring for minesweeping. Production amounted to 279 units.